A dying sheikh sets out with a caravan for his final journey. He wants to be buried in the land where he was born, Sijilmasa. But he dies before he can get there, and the road being difficult, most of those charged to get him to his destination bow out of their duties. Not Ahmed (Ahmed Hammoud) and Said (Said Aagli), though. They offer to the Sheikh's wife to complete the journey, although one wonders if these two shady characters really intend to fulfill their bargain, or if they see some sort of score here. We then shift to a scene that's sort of like an Arabic Home Depot parking lot, I guess. A large group of men are gathered in a parking lot looking for short term labor. But not building houses. Apparently the jobs on offer involve driving. But there's some sort of metaphysical aspect to the job, as well. One of these aspiring workers is Shakib (Shakib Ben Omar), who gets a gig accompanying Ahamed and Said on their quest. It's unclear exactly how he knows where to find them, or even if these two parts of the film take place in the same era. 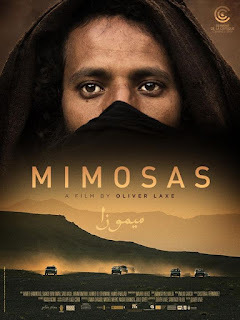 From this setup, MIMOSAS takes its characters and its audience on a journey both physical and spiritual, with Shakib coming across a bit like Clarence in IT'S A WONDERFUL LIFE as he tries to instill faith in Ahmed, and get him to take responsibility for his path in life. Director Oliver Laxe, who also co-wrote the film with Santiago Fillal, gives his film a leisurely pace. And while it's not some surrealist work ala David Lynch, he doesn't exactly spell out his message. I'm not even sure I got it, to be honest. However, the film's dessert scenery is lovely to look at, and the characters and the narrative are compelling if sometimes a bit vague. 3 out of 4 stars.